THIS OFFER IS NOT AVAILABLE IN STORES Fill out the form below to order your Nerve Pain Away™ now! Upgrade to the deluxe version size with 50% larger bottles for just an additional $5 more per bottle. 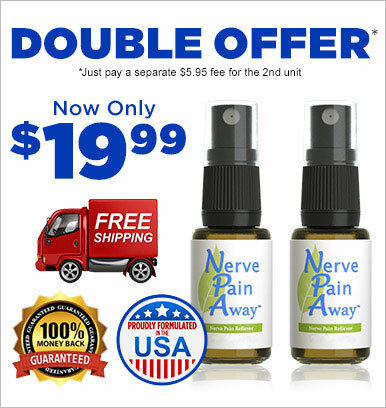 Buy a bottle of Nerve Pain Away™ for only $19.99 plus FREE SHIPPING and you will get a second bottle, just pay a separate $5.95 fee. That's a grand total of $25.94 for 2 bottles. Or you can upgrade to our deluxe version size with 50% larger bottles for just an additional $5 more per bottle. That's a grand total of $35.94 for the deluxe version. A $1.00 web service fee will apply to all orders. **This product is intended to treat temporary nerve pain and discomfort. This product is not intended to cure any particular disease or condition. If your symptoms last longer than a week consult your doctor, as persistent symptoms may indicate more serious health issues. If you are taking prescribed medications, do not discontinue use, Nerve Pain Away can be used with them.